Antalya offers plenty of things to do for everyone. If you want to dose up on sightseeing, you'll find a fascinating line-up of tourist attractions to keep you busy. The labyrinthine old town is full of atmospheric historic sites, while the city is perfectly placed to act as your base for sightseeing around the outlying area, where dozens of grand ruins await. It's not all history, though. This city is also a great spot for your launch onto the white-sand beaches of Turkey's Turquoise Coast. Beach lovers and history buffs will both leave satisfied. Plan your trip with our list of the top tourist attractions in Antalya. The maze-like Kaleiçi neighborhood was made for strolling. Perfectly restored whitewashed and red-roofed Ottoman mansions line the cobblestone streets, now home to a plethora of boutique hotels, souvenir shops, art galleries, and restaurants. Although it's more a place to simply breathe in the old-world ambience, there are also plenty of small tourist attractions for those who want to sightsee. The main square (Kale Kapisi) has a fortress gate and stone-clad clock tower, while the 18th-century Tekeli Mehmet Pasa Mosque is worth a look just for its stunning interior tile work. Along Hesapçi Sokak, you'll find the graceful Kesik Minare (truncated minaret). Destroyed by fire in the 19th century, this is all that is left of a building that started its life as a Roman temple, was converted into a Byzantine church, and finally became a mosque. Nestled into a recess in the cliffs, Antalya's old harbor is a picturesque huddle of boutiques, pretty cafés, bazaars, and gently bobbing yachts that look out over the shimmering Mediterranean. With its peaceful pleasure-boat atmosphere now, it's difficult to imagine this place was once Antalya's major economic hub, but from the 2nd century up until the mid-20th century, this was the main port, bringing trade and prosperity to the city and surrounding region. These days, you come here to shop and then watch the sun set over the sea while you sip a coffee, or you can head out onto the Mediterranean on one of the many excursion boats to swim, sightsee, and spread out your towel on an empty beach. If you're at all interested in Turkish history, don't miss this excellent museum. The dazzling exhibits here showcase all the best finds from excavation sites across the Turkish coast. Even better, the collection is displayed in exemplary fashion, making Turkey's rich (and rather complicated) history easy to understand. The large archaeological section offers displays from the Bronze Age to Byzantium, with a particular emphasis on ruins in the nearby area. If you're short on time, make a beeline for the galleries containing the mosaics from Seleukeia, silver hoard display from Aspendos, and divinity statues from Perge. Antalya's most distinctive landmark is the Yivli Minare (fluted minaret), built by the Seljuk sultan Alaeddin Keykubad (1219-36). The minaret is a typical example of Seljuk architecture, with a square base surmounted by an octagonal drum bearing the fluted shaft, with its corbelled gallery around the top. The attached 14th-century mosque is still in use today. The minaret is right beside the Kale entrance gate into the old city. Opposite the minaret is Antalya's Ottoman-era clock tower, while nearby are some tombs dating from the 14th century. Hadrian's Gate is one of the main (and the most dramatic) entrance gates into the Kaleiçi district. Considerable stretches of the Hellenistic and Roman town walls on the eastern side of the old town have been preserved, and Hadrian's Gate is the most notable of these sections. Erected in honor of the AD 130 visit by Emperor Hadrian himself, this imposing three-arched marble gateway, flanked by imposing towers, is decorated with rich sculptural decorations. As you walk through the arches, look up at the ceiling to view the best preserved carvings. Built in the 2nd century, this squat 14-meter-high cylindrical tower watches over the old harbor from high above on the edge of Karaalioglu Park. No one is quite sure what its main function was, but most agree it acted as a watchtower or lighthouse over the busy port below. Now it's a fantastic spot to watch the sunset or get that all-important panoramic view over the old harbor area. The park itself is prime picnicking territory and a tranquil, flower-filled spot to escape the city streets. Do as the locals do and come here at dusk to promenade. Excellent cafés are also nearby if you need to recuperate after sightseeing. The main reason history buffs visit Antalya is to make the day trip to Aspendos, about 47 kilometers east. This archaeological site is home to a Roman theater commonly thought to be the best preserved in the world and one of the top tourist attractions in Turkey. The glory days of this dazzling, ancient town were during the 2nd and 3rd centuries, when most of the ruins that can be seen today were built. Apart from the theater, which has been fully restored and can seat 15,000 people, much of the rest of the site still lies in ruins and is probably only interesting to the most enthusiastic sightseer. If you're short of time but keen to pack in as many highlights of the Antalya region as you can, the Aspendos, Perge and Manavgat Waterfalls tour allows you to cover three of the most popular attractions all in one day. It includes tours of the Roman ruins of Aspendos and Perge, entrance to Aspendos and the waterfalls (which are near Side), lunch, and pickup and drop-off from your Antalya hotel. Aspendos may get all the tourism fame, but Termessos, 34 kilometers northwest of Antalya, beats it hands down for atmosphere. Neither the Greeks nor the Romans managed to tame the war-like Pisidians, who fiercely protected their independence from the mountain eyrie of Termessos. The well-preserved remains of this ancient city lie scattered along a rugged hillside with jaw-dropping views across the surrounding countryside. Wear sturdy shoes and take plenty of water if you want to fully explore this site. The colonnaded street and upper agora are particularly impressive but don't miss the theater, where the vistas across the peaks of the Taurus Mountains are astounding. Perge's vast and rubble-filled stadium, half-destroyed temples, and huge colonnaded agora are imbued with an atmosphere of past glory. This was once the capital of ancient Pamphylia, which blossomed under first Greek and then Roman rule. The ruins here, about 17 kilometers east of Antalya, are not as well-preserved as others on Turkey's Turquoise Coast, but this also means they attract fewer crowds, leaving visitors able to explore the long colonnaded streets and half-collapsed temples in peace. The Roman baths, Hellenistic Gate, and Acropolis are all particularly interesting. The near-twin villages of Olympos and Çirali, about 84 kilometers southwest of Antalya, sit on a piece of lovely coastline near the overgrown ruins of the ancient Lycian city of Olympos. As well as the ruins, the famed attraction here is the chimaera, a naturally occurring eternal flame that flickers out of the rocky cliff above. Olympos is popular with young backpackers and has a reputation for being lively at night, while Çirali is more laid-back and all about chilling out on the beach. Both are perfect for anyone seeking a beach holiday well away from Turkey's purposely built-up tourist resorts. East of Antalya's town center, Konyaalti Beach is one of Antalya's two prime sweeps of sand, with a picturesque backing of mountains rolling down to the coastline beyond. During summer, this strip (which is more pebbly than sandy) is hugely popular with both local and foreign visitors, and lazy beach days are made simple with plenty of facilities provided. Sun loungers with umbrellas can be rented, there are good toilet and shower facilities, and the palm tree lined promenade behind the beach is rimmed with snack shops, cafés, and restaurants for when you get peckish. The limestone countryside around Antalya is rich in karst springs, sinkholes, and waterfalls. The lime deposits from these springs have built up over a period of 1.5 to two million years into vast travertine terraces similar to the famed terraces at Pamukkale. Kirkgöz and Pinarbasi (just to the northwest of Antalya) have springs and sinkholes to see, while at Düdenbasi, a cascade of waterfalls tumbles down a narrow gorge. There are both upper falls (Düdenbasi Selalesi) and lower falls (Düden Çayi) to admire, and a trip here makes a nice nature break from Antalya's glut of historic attractions. To the south of Antalya's center, Lara beach is popular for its soft white sand and good family-friendly facilities, backed by cafés and restaurants and with plenty of activities, from jet-ski rentals to stand up paddleboards for those who want to hit the water. Sun loungers and umbrellas can be easily rented for those who want to do nothing more strenuous than soak up the sun. This area is where the vast amount of Antalya's beach resorts are located so do be aware that during the peak summer months, this beach can get crammed. The Karain Cave, about 27 kilometers northwest of Antalya, near Dösemalti, was inhabited by prehistoric man and has yielded finds from both the Lower and Middle Paleolithic eras. Excavated finds here include bones and teeth belonging to Neolithic man. Some of the finds are on show in the small but remarkably comprehensive museum on-site. The wide, arching caverns here are a good opportunity for some easy caving and are very popular with local families having a break from the city. If you can, try to come on a weekday, when they're less busy. If you have a rental car, the cave and museum combined with the karst springs a little farther north make a good day trip. The old Lycian port of Phaselis, about 60 kilometers southwest of Antalya, is where Alexander the Great set up his winter quarters in 334 BC. There are remains of a theater, aqueduct, temples, a colonnaded street, and a Hadrian's Arch Gate erected in AD 114. The seaside location of the ruins is very pretty, and a museum on-site displays excavated finds. If you have time, a couple of kilometers before Phaselis is the Olympos Teleferik (cable car), which journeys up the side of Tahtali Mountain to the summit at 2,275 meters for panoramic vistas over the coast. About 45 kilometers north of Antalya, the Kocain Magarasi lies hidden deep within the karst mountains of the region. The 600-meter-long cave was first investigated by K. Kökten, whose finds here prove that it was inhabited in prehistoric times. At the entrance is a huge Roman cistern and also traces of a very early settlement. The cavern here is colossal and boasts some mammoth stalagmites, which have formed into weird and wacky shapes. Bring along a torch and wear sturdy shoes if you want to explore the cave's interior as it can get slippery underfoot. If you are looking for things to do around Antalya, the Köprülü Canyon National Park (also easily accessible from Side), with the green-blue water of the Köprülü River snaking through dramatic and craggy high cliffs, is one of Turkey's most popular white water rafting destinations. If you feel like balancing out all the historic ruins of the region with an adrenaline rush, plenty of half-day rafting tours are offered from Antalya. If you're visiting Antalya for the first time, the best area to stay will depend on your sightseeing goals. If your main focus is to soak up the city's historical ambience, base yourself in Kaleiçi, the Old Town, with its tangle of cobbled streets and whitewashed Ottoman mansions. If sun, sand, and sea are your priority, the beach resort town of Lara, with its upscale all-inclusive resorts, makes the best base. From here, the Old Town is about 30 minutes away by car-an easy day or half-day excursion. Luxury Hotels: On the beach in Lara, the Aska Lara Resort & Spa is a family-friendly five-star resort with multiple pools; an opulent spa; and an entire entertainment zone complete with a waterslide park, ziplines, and a climbing wall to keep younger travelers happy. The perfect place for a luxurious and easygoing family holiday, Delphin Imperial Hotel, also on the beach in Lara, offers up big modern rooms with blonde-wood accents and balconies; massive grounds with tennis courts and multiple pools, so there's always space for you to sunbathe; a gym; spa; and plenty of dining choices. For the smaller members of traveling families there are well-equipped play areas and waterslides. For all-inclusive living, Liberty Hotels Lara is another family-friendly beachfront choice known for its excellent restaurants, contemporary rooms, and masses of pools. Kids can buzz down the waterslides, play in the arcade and games room, or join in the kids' club activities, while adults can indulge in the spa or play some tennis on the courts. Mid-Range Hotels: In Antalya Old Town, right in the heart of the city, Kaucuk Hotel has plenty of boutique style, with stone-walled rooms, many boasting intricate wooden ceilings and exuding old-fashioned Ottoman style, and a palm tree speckled courtyard with a pool. Breakfast is included. Nearby, another Old Town gem is the welcoming Eski Masal Hotel with an included breakfast, a courtyard pool, and idiosyncratically designed rooms, each with their own unique character. Budget Hotels: Also in the Old Town, the sparkling clean Hotel Frankfurt is a solid central choice just a mere eight-minute stroll from Hadrian's Gate. The homey and great-value Hadrian Gate Hotel is only 100 meters away from its namesake attraction. There's a pool here and an included breakfast. Also in the heart of the Old Town, and a five-minute walk from the beach, the top terrace of the popular Bacchus Pension presides over magnificent sea views. Kaleiçi Tours: The Antalya Electric Bike Tour makes for a leisurely four hours of sightseeing, taking in the main sights of Antalya's Old Town district, including Hadrian's Gate and the Roman Harbor. Pickup and drop-off from Antalya hotels and a snack are included. Antalya City Tours: The Antalya City Tour is a good choice if you're short on time. In one day, it packs in a walking tour of Kaleiçi (Antalya Old Town), a one-hour boat trip from the Roman Harbor to view the spectacular coastline, and a visit to Antalya aquarium. Lunch and pickup and drop-off from your hotel are included. 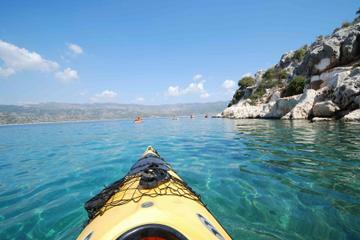 In the Region: Antalya is a great base from which to hit the road and explore the coastline. To the south, within day-tripping distance, is Side with its bundle of Roman ruins and beaches. To the north, head to the pretty village of Kas, surrounded by beautiful Mediterranean coastline. More Cities: Antalya is one of Turkey's biggest cities. For more city life, Istanbul is Turkey's buzziest and most cosmopolitan, while Konya is home to plenty of historic buildings as in the home of the Whirling Dervishes.